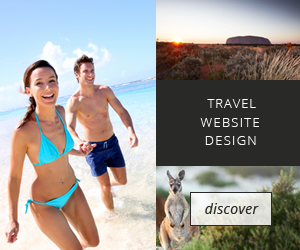 Tourism in the Great Barrier Reef region. 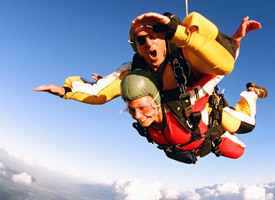 There are a diverse range of tourism operations in the Great Barrier Reef including day tours, overnight and extended tours, snorkelling, scuba diving and fishing charters, long range roving tours, aircraft or helicopter tours, bare boats (self-sail), glass-bottomed boat viewing, semi-submersibles and educational trips, cruise ships, beach hire and water sports, passenger ferries, whale watching and swimming with dolphins. The Great Barrier Reef is famous for it’s great scuba diving locations. 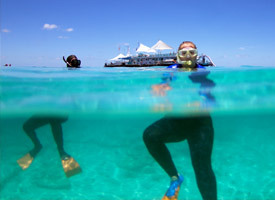 Australia’s Great Barrier Reef offers a range of diving experiences for both the beginner and the experienced diving expert. To get a complete grasp of the sheer magnitude of the Great Barrier Reef, you need to stop swimming, get out of the water, let your feet leave the pure-white beaches and take to the air! The best thing is, visiting the Great Barrier Reef can be experienced on a budget and can also be a great Luxury Australian Experience. The marine tourism industry is a major contributor to the local and Australian economy generating over $4.228 billion per annum in 2003. It is the largest commercial activity in the Great Barrier Reef region, playing an important role in presenting the World Heritage listed Great Barrier Reef Marine Park to a wide range of visitors. 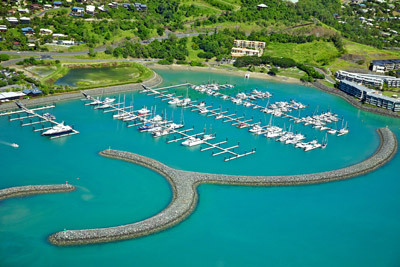 For many visitors to coastal Queensland, the tourism fleet is their primary means of experiencing the Great Barrier Reef. There are approximately 820 operators and 1500 vessels operating in the Marine Park. In the 1890s, Green Island became one of the first destinations for pleasure cruises off the coast of Cairns, starting what was to become organised tourism on the Great Barrier Reef. By the 1930s tourist resorts were being developed at Green Island and at Heron Island further south. During the first half of the 20th century, limited transport and boating technology meant that most tourist activity was inshore and close to regional centres. 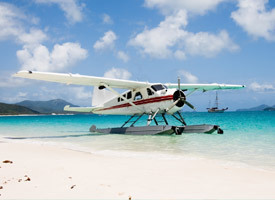 By the 1970s tourism was starting to show steady growth in visitor numbers, most notably at Green Island and in the Whitsundays. Reef tourism grew rapidly in the 1980s and early 1990s, assisted by improved air access to a number of regional centres and vastly improved road transport links. In the early 1980s visitor numbers to the Marine Park were increasing by about 30% per year. There was also a steady growth in the number of operations over this time, and the capacity, range and diversity of products offered expanded markedly. Day trips to the reef were commonly extended to over 50 nautical miles. In 2005 the tour vessels used by operators range in size from small sailing vessels, which typically take fewer than 20 people, to the large luxury wave-piercing catamarans, which carry up to 400 people. There are also an increasing number of cruise ships and super yachts cruising the reef. Around 40% of Great Barrier Reef tourists are serviced by the 10 largest operations. Over 85% of visitors go to the offshore Cairns/Port Douglas and Whitsunday areas which make up less than 10 % of the Great Barrier Reef Marine Park. Reef tourism has rapidly grown in recent years and regardless of the size, destination or style of a tourist operation, its tourist operators provide their customers with a wide range of activities and the very best experience possible.